NEW ORLEANS | It was my first time in New Orleans. Maybe I should start with that. I had arrived on a Wednesday, a full five days of work awaiting. I had the most superficial understanding of New Orleans. Café Du Monde. Drew Brees. The Superdome. Katrina… and the scenes from the aftermath. Bourbon Street. That Simpson episode where Marge plays Blanche DuBois in a musical adaptation of “A Streetcar Named Desire.” And so on. This was my New Orleans. And then came Tuesday afternoon. My last day. For five days, I had covered basketball, tracking a Kansas team that wouldn’t wilt, and a Kentucky team that couldn’t. For five days, I had walked the streets of the French Quarter, all of its tackiness and beauty and charm blending together in some strange concoction of Bourbon-infused wonder. They call this place Le Vieux Carré … the Old Square. Or at least they did. As I walked the streets of the French Quarter on that final day, I thought back to the previous five days, my mind scanning through the fog of writing and basketball and Pappy Van Winkle. I had devoured a bowl of rabbit and sausage Jumbalaya at a tiny, little hole called “Coop’s Place”, the type of restaurant where they make you wait in line outside, and the bartenders and servers feel no need to be courteous or accommodating. It’s as if to say: You’re getting to eat here… Coop’s Place. That should be enough. I had watched two friends order Pappy Van Winkle at a little bar called Sazerac inside The Roosevelt Hotel. It was the kind of place where the bartenders talk like they’re working in a speakeasy; the kind of place where they still brag about inventing the first cocktail in the world: Yep, the Sazerac. “Somebody finally realized how to make alcohol taste good,” the bartender would say. 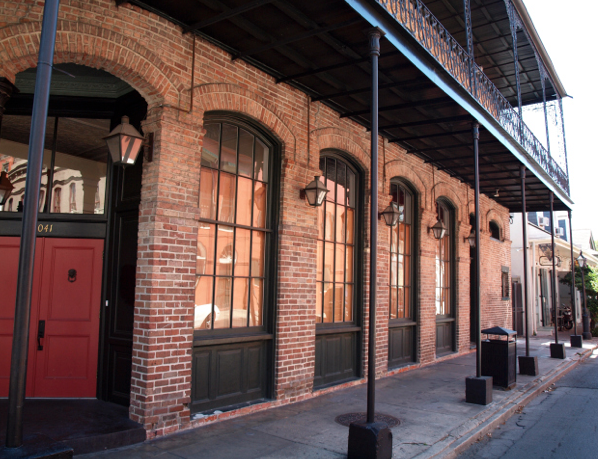 I had spent a night at Pat O’Brien’s, the quintessential New Orleans bar, the kind of place that toes the line between authenticity and commercialism, the kind place where you can have beautiful conversation with good friends you haven’t seen in years… or friends you never knew. And, lastly, I had spent hours and hours at a little dive called Evelyn’s Place, a place just a few paces off Canal Street; a place where Charles Pierce could walk in at any moment and fire up the jukebox (and did); a place where the hardened lady behind the bar might decide to close up at any moment; a place where you might stay up until daylight, just thinking about work, and writing and why you’re in this particular place at this particular time. Finally, the scanning was done. I looked down the alley, the swaths of pavement pocked-marked with trash and rain puddles filled with cigarette butts. And finally, in that moment, I took off running. I ran over to the river, past a cruise ship snaking its way through the Mississippi, on the way out to the Gulf. I kept running past the French markets, the New Orleans bohemians with their braided hair and tattoos, past the restaurants that push fried alligator and oysters, and past the bakeries that sell beignets. I ran past a street musician, a young guy singing a raspy acoustic tune, the kind of thing you might hear from John Darnielle. I ran past the storefronts and balconies and galleries, the architecture influenced by the Spanish in the late 18th century. I ran past the art galleries, the antique shops, the places where the coolest people you’ve ever seen walk out the front door. And then, after all that exploration, after all that running and looking and living, I reached Esplanade. Esplanade Avenue starts at the Mississippi River and it keeps going… past houses that belong to millionaires. It’s a two-sided street with a raised medium in the middle, and on the day I ran, it was eerily quiet. There was a mailman. And a few pedestrians. But mostly there was sun and silence. I looked at the houses, old houses… places that belonged in a different time. Nineteenth Century mansions. This is Esplanade. This is the South. This is New Orleans. I kept running and the neighborhoods started to change. Still beautiful. Still Southern. But different. I had heard a story earlier in the week. It was a New Orleans story. Somebody was trying to explain the heart of this city, why so many felt so comfortable here, why so many kept hope alive after the storm, why the city survived. In my last hours in New Orleans, I was left all alone. My colleagues had left. I had called an old friend, and been left to fend for myself. I had to do a little work, so I was trapped in my hotel until close to 10 p.m. Finally, I was free. And I was hungry. I walked out into the quarter, looking for someplace cheap. I settled on a little corner daiquiri store on Bourbon Street, the kind of place where you can also buy pizza by the slice. I bought a piece of sausage and pepperoni pizza, and as I began to eat, the storm showed up. It rained. And thundered. And poured. Rain. Rain. Rain. For nearly 30 minutes, I was trapped inside this corner daiquiri store — as ear-splitting Reggaeton played on the speakers. Across the street was a piano bar. A chain. I could hear feint sounds of music. The rain kept pouring. It was the most depressing New Orleans moment I could think of. All the tackiness in one feeling. Cheap pizza. Commercialism. All the annoyingness of Bourbon Street. For a moment, I thought back to a few hours earlier. My run on Esplanade. After all the running, through all the neighborhoods, through all the strides and sidewalks, I had stumbled upon a street sign, the most pieceful intersection in all of New Orleans, the kind place where you get goosebumps. In that moment, I wanted to bottle it all up, keep it for the future, explain it to everyone that had ever existed. This is the New Orleans I wanted.